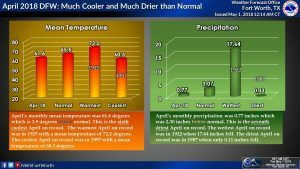 April 2018 was much cooler and much drier than normal at DFW. This was the 6th coolest and the 7th driest April on record. The monthly mean temperature was 61.6 degrees which was 3.9 degrees below normal. 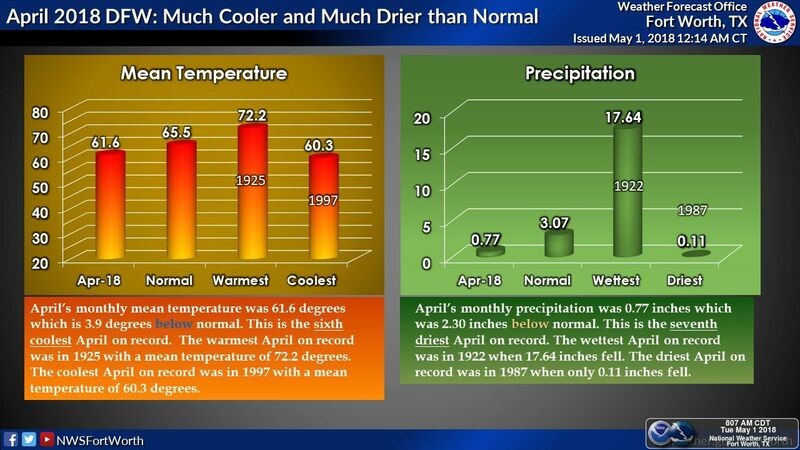 The mean high temperature for April was 74.4 degrees which tied for the 36th coolest and the mean low temperature was 48.9 degrees which was the coolest on record. DFW only received 0.77 inches of rain which was the 7th driest on record. Only 1987 (0.11″), 1920 (0.51″), 2005 (0.56″), 1937 (0.58″) and 1903 and 1983 (both 0.59″) were drier. This entry was posted on Tuesday, May 1st, 2018 at 10:11 am	and is filed under Climate, Historical, News. You can follow any responses to this entry through the RSS 2.0 feed. Both comments and pings are currently closed.